Morrow Renewables is a privately owned company that provides integrated waste-to-energy solutions to the private and municipal waste sector. 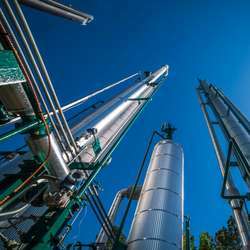 Since its inception in 1986, Morrow has received two patents in biogas treating, led the industry in plant run-times and methane efficiencies, and established a reputation as one of the top biogas treating firms in America. Morrow is the only U.S. company that develops, designs, manufactures, operates, and supports biogas projects. They build custom-engineered processing solutions appropriate for their clients’ specific production criteria. From design to operation, Morrow Renewables’ unmatched integration of the entire RNG value chain allows them to preserve the integrity of their operation and negotiate some of the most dynamic deal structures in the industry. With over 180 employees and 60,000 sq. feet of indoor heavy fabrication, Morrow is a recognized leader among successful renewable natural gas project developers in the industry. Guided by their core values of integrity and sustainability, they focus on delivering high performance assets that maximize value for their clients. Morrow has also received two patents on biogas treating, and is a founding member of the Renewable Natural Gas Coalition, a non-profit trade association comprised of over 125 companies and organizations. Visit Morrow Renewables’ Website for more information.